This blog is the spiritual successor to my previous similarly titled blog post that debunked a widely-reported study claiming America was one of the top ten most dangerous countries for women. As I pointed out at the time, the report heavily weighted the subjective judgements of "experts." The result is that a bunch of Westerners polled at the height of the #MeToo failed to look beyond their bubble and declared the U.S. the third-worst country in the world for "sexual violence." Seriously. Now we have another drastic finding being picked up and spread by the media. These stories are based on a report put out by Reporters Without Borders, a group that does a lot of good calling attention to threats to journalism worldwide. Unlike the violence against women report, it actually relies on things like numbers and data. So there's that. 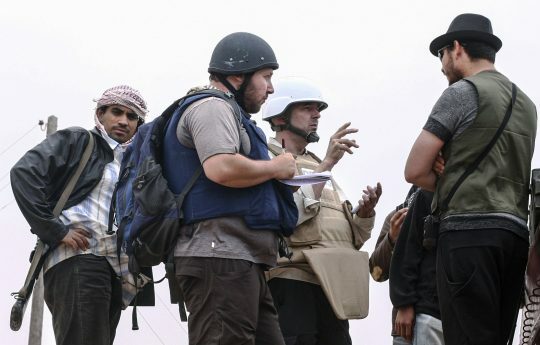 What the report actually found was, yes, the U.S. had the fifth-most journalists killed in the line of duty in 2018, tied with India and behind Afghanistan, Syria, Mexico, and Yemen. But it's mathematically illiterate to take that datapoint and claiming it proves more abstractly America is the fifth "most dangerous country for journalists," behind countries such as Russia and North Korea. First, it makes little sense to use the raw number of deaths in country-by-country comparisons, rather than the rate of journalists killed. The U.S is the third-most-populous country in the world. Even if the rate of journalist deaths remained consistent across all countries, the U.S. would rank in the top five of total deaths. It might sound bad to hear the U.S. had six times as many journalists killed this year as Slovakia, but when the U.S. has around sixty times the population, Slovakia is actually ten times more dangerous. Second (and I don't want to come across as glib here, because even one death is a tragedy), the grand total of journalists killed in the U.S. this year was six. The global total was sixty-three. The death of a journalist is a very, very rare event, rare enough that even a small number of unlikely incidents is enough to catapult a nation into the ranks of the "most dangerous." Of course, that's exactly what happened. On June 28th, a deranged man with a vendetta against local Maryland newspaper Capital Gazette walked in and killed four employees in the single worst attack on journalists in modern U.S. history. The other two deaths were journalists covering Tropical Storm Alberto in North Carolina, killed when a tree fell on the highway. Both tragedies, but clearly outliers rather than barometers for the level of danger faced daily by American journalists. Here we hit upon the third point; the number of journalists "killed" was compiled regardless of the manner of their death or the perpetrators. When it comes to calculating threats to journalism, no one would say that a freak accident like a tree falling should be treated like an ISIS execution, or that a local crazy is like a Saudi prince. But that's the result if you use the raw number of deaths as a stand-in for "danger." Lastly, murder is only one form of state-imposed "danger" faced by journalists. The Reporters Without Borders report also tracked the number of journalists imprisoned, taken hostage, or "disappeared" on the job. Unsurprisingly, the U.S. appears on none of those lists. By using only verified deaths as a metric for "danger," countries like Turkey, China, Iran, and Egypt get a pass because they prefer to merely imprison and torture journalists. As a post-script, I'll note that it's particularly wrongheaded to use this isolated finding to attack President Trump. "Calling us the enemy of the people and ‘fake news' has led to this," froths CNN's Brian Karem above, racking up thousands in retweets. Again, there were exactly two deadly U.S. incidents cited in the report, and neither the insane Maryland killer nor the tree were inspired by the president's rhetoric. It's insulting to the journalists who do report in the face of death every day to act as though we've got it just as bad in America. America is one of the safest countries in the world to be a journalist, and protects freedom of the press to a high degree even by Western standards. That's something we should be proud of. This entry was posted in Politics and tagged Brian Karem, Journalists, NBC News. Bookmark the permalink.